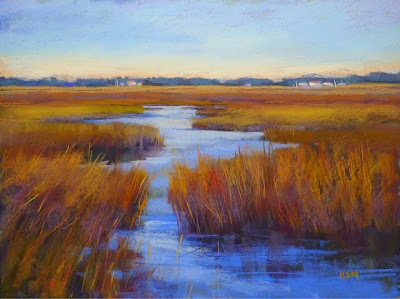 Tonight, I would like to feature the work of an amazing artist, Karen Margulis. She works in pastel, and has a fabulous sense of colour and design. The painting above is titled Ribbon of Blue. It is available for purchase on her Website and also can be viewed on her blog. I really like this painting because in this composition, the blue zigzag of water draws the eye right into the space. As well, she has used colour to provide dramatic contrast and yet at the same time to develop the image as a unified whole. Finally, I like the way that she has not overworked the painting, but has left areas that are suggestive or somewhat unresolved. This adds interest and keeps me looking at the painting for a long time. An example of this are the marks just above the line of the horizon. My eyes keep going there as I try to understand if I am seeing clouds, or birds, or smoke, or perhaps the suggestion of far away hills. As well as being a marvellous artist, Karen writes thoughtful posts on techniques and her artistic practice. For example, in recent posts, she has talked about strategies she uses to give herself permission. One such strategy is finding ways to give oneself permission to stop working on a picture before it loses its freshness and becomes overworked. Another strategy is to use poor photos as references, which is more likely to result in colour improvisation and greater looseness, rather than rigid copying of what appears in the photograph. I have added a link to her blog to my blog roll. Follow it or any of the links above to enjoy more of her work.